It seems the more hushed that Julien Baker sings into her microphone, the closer people lean in to listen. In the two years since her debut album, SPRAINED ANKLE, the Tennessee-based 22-year-old has received sizable attention, securing opening slots for headliners such as Death Cab for Cutie and Belle and Sebastian, and playing to packed festival audiences who stand as reverent as churchgoers on Sundays. 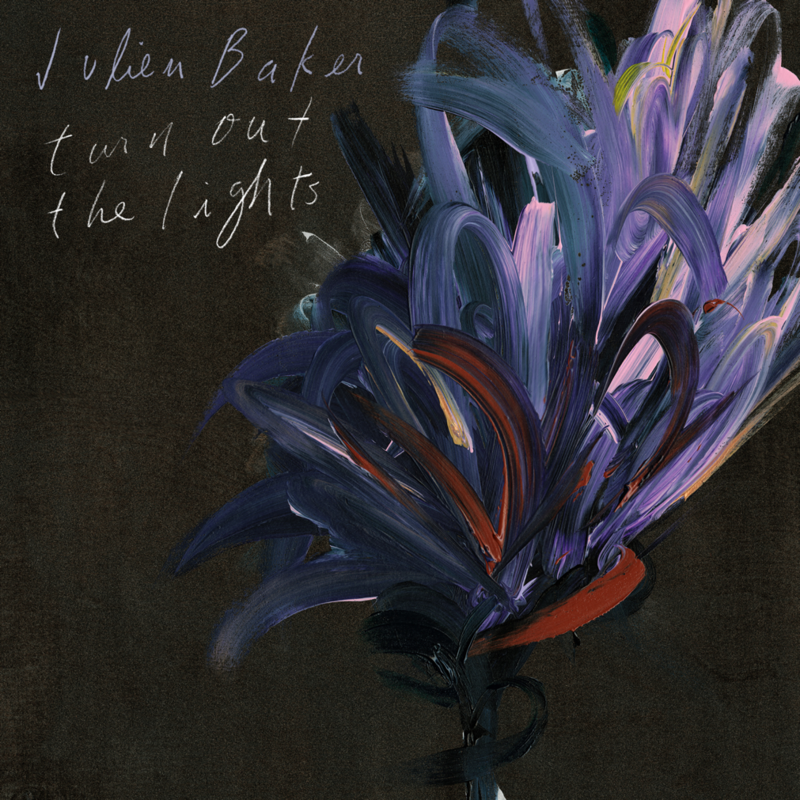 Dipping into a well of heartbreak, fear, and potent faith for each new release, fans undoubtedly wonder: What did we do to deserve Julien Baker? Picking up from where she left off with SPRAINED ANKLE, Baker is far from reconciliation with the demons that haunt her. Her lyrics are even more poignant and her melodies even more daring. TURN OUT THE LIGHTS finds Baker falling from and toward grace with the force of a blazing comet. For devotees of Baker’s previous work, the rules of the game have already been spelled out. Her songs feel like diary entries with ink-stained pages filled with exasperation and penitence. There are bouts of hopelessness and there are breakthroughs of clarity. While keeping the raw, soul-bearing style of her past works, the production on TURN OUT THE LIGHTS is noticeably raised a notch—not a big notch, but more of a subtle transition of an artist coming into their own. The adjustment evokes that of British singer-songwriter Keaton Henson, whose latest album, KINDLY NOW, was elevated with just a hint more studio polish. And like KINDLY NOW, tracks such as “Hurt Less” and “Shadowboxing” are invigorated with a peppering of strings that add a layer of gravitas to the work. Even this minor addition allows these songs to grow in stature, towering to heart-lurching heights. On SPRAINED ANKLE, Baker quickly revealed that she had serious vocal chops (which she also shows in her role as lead singer of the band Forrister). But the prowess she demonstrates on TURN OUT THE LIGHTS is unprecedented, with her voice a devoted servant to the heart of each song, never taking a moment for self-indulgence. It’s the blood that flows through her music, breathing life into it. Ideas twist and contradict each other, confessions spill and vexing questions are raised. “Isn’t that what you want? For me to be miserable like you?,” she dares on “Even,” with a slight snarl. “Brother you’re about to get your wish / Putting my fist through the plaster in the bathroom of a Motel 6.” Gone is the self-ashamed contrition oft found on SPRAINED ANKLE. In its place is a resistance, a white hot flame burning through the darkness. If SPRAINED ANKLE felt like it was sung from the safety of the confessional booth, TURN OUT THE LIGHTS is Baker’s step up to the pulpit. Lyrically, she’s become more intense in her imagery—from alluding to a sprained ankle on her first album, Baker now describes herself on “Televangelist” as “an amputee with a phantom touch.” Her allusions continue in “Hurt Less,” where she uses the elementary topic of a seatbelt and weaves it into a parable-esque moment of self-reflection. Other songs feel as if she’s sharing her rumination with just one person in private. One of these moments happens within the album’s mammoth closer, “Claws in Your Back.” In the middle of the song, Baker’s voice ebbs and she confides, “Living with demons I’ve mistaken for saints / If you keep it between us, I think they’re the same.” Her resolution to continue to live in spite of suffering and distress culminates in the end with a shattering “I wanted to stay.” It’s pure, unadulterated release—a catharsis that may not be joyful, but sounds really and truly alive. So often we seek music that has the ability to transport us, to deliver us to a place further removed from our troubles. TURN OUT THE LIGHTS offers no escape. At this point in her career, Baker has become a crusader for music that doesn’t shy away from the grit and tar that line our souls. She reaps the rich emotional territory of her own life and presents us with the feelings that lie deep within ourselves. It’s about time we face them.